I have been into juice again lately – probably because the weather has been getting warmer and cool drinks are coming back into favor. As anyone who has cleaned up their diet knows, once you live “cleanly,” you crave healthy things like fresh juice, greens, and other things you may have previously not even considered eating. The “problem” with juicing – if there is one – is what to do with the leftover pulp. Whether you’re juicing with a Ninja Blender or traditional juicer, unless you are doing “whole food juicing,” you’ll have two products from your endeavors: 1) Juice and 2) Pulp. 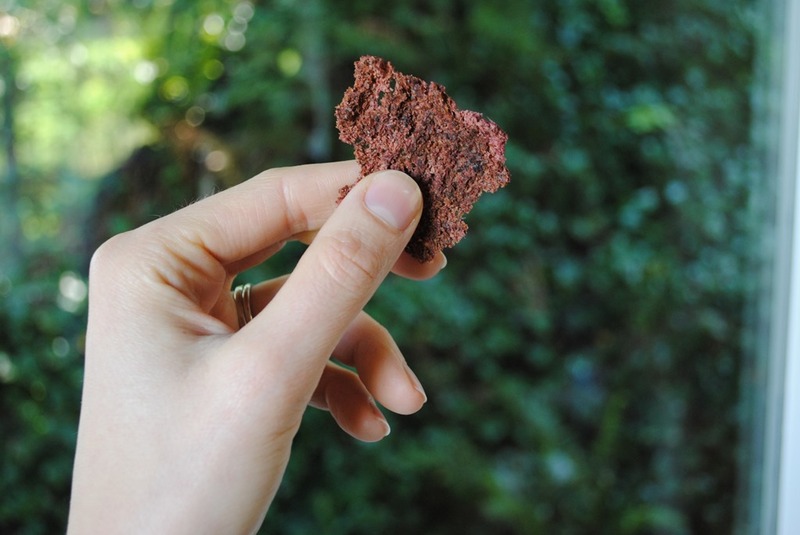 Before you throw that pulp away, consider turning it into crackers! I certainly didn’t get this way overnight, and, I’m not perfect by any means, but in general, when it comes to snacking, I try to keep it healthy, and juice pulp crackers are an amazing solution to the night time snacking conundrum. 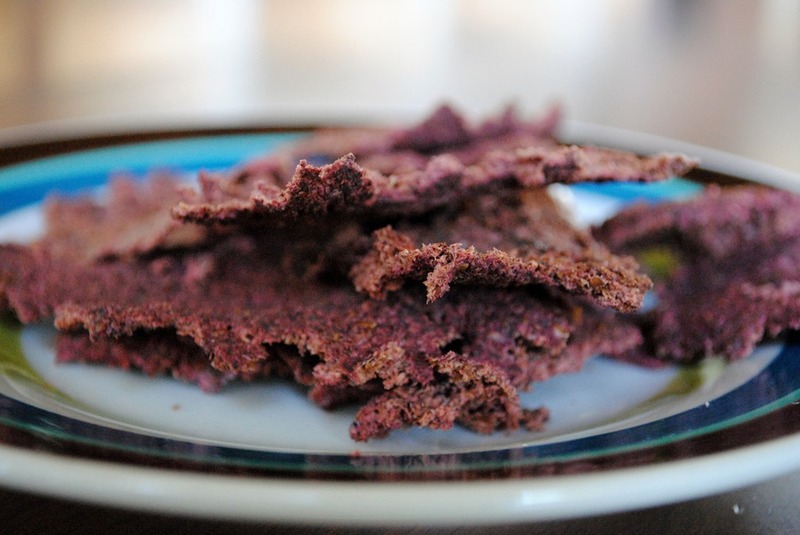 You may think I’m absolutely certifiable, but, with some juice pulp, a little flax or chia seed, and a dehydrator, you can create a unique cracker that you can feel good about eating. I can’t keep enough of these in stock! 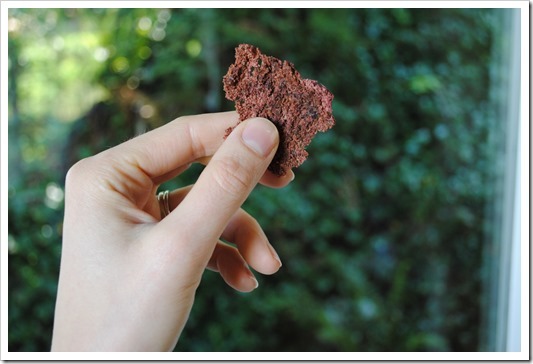 My go-to juice lately is carrot/beet, so I’ll use that example to walk you through making these simple snacks. To make the juice, I use 4-5 large carrots, 1/2 a beet, and 8-12 ounces of filtered water. Then, I strain the pulp from the juice using a mesh strainer over a bowl. I mix the pulp with some flax seed (yay for being able to eat flax again – for years I thought I had a sensitivity to it! ), and then dehydrate. Now might be the time to mention that in addition to being on a juice kick, I’m on a dehydrating kick. Poor 2Chili can’t catch a break – there is always some machine going at full tilt in our humble home. Now might also be a good time to point out you could also do this with the pulp you have leftover from making almond milk. If you used your Ninja Blender to make the juice and strained it, you likely won’t have to add water. If you used a juicer and have a very dry pulp, you’ll need to add water at your discretion to help everything blend together. 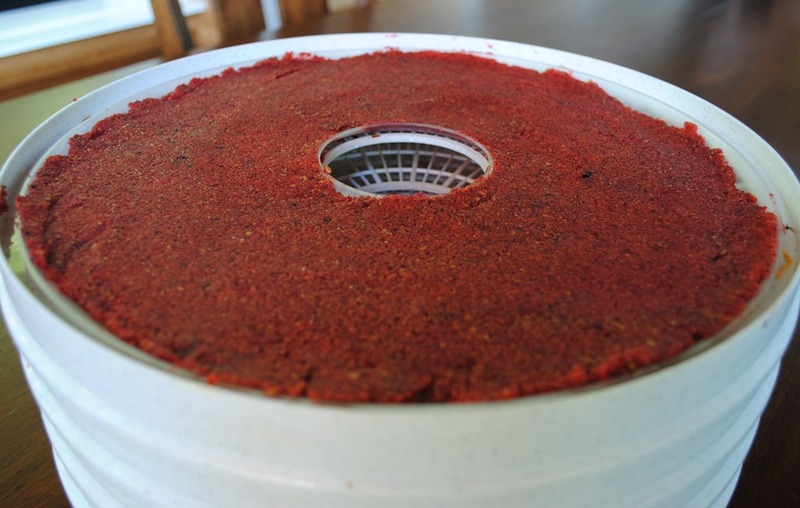 Spread mixture into an even layer on a dehydrator fruit roll sheet. If you are looking for “orderly” crackers, use this time to score the shapes you want. I don’t bother with this step. You want the layer to be at least 1/8” thick so you actually have something leftover when all the water dries out. A paper-thin layer will just leave you with crumbs. 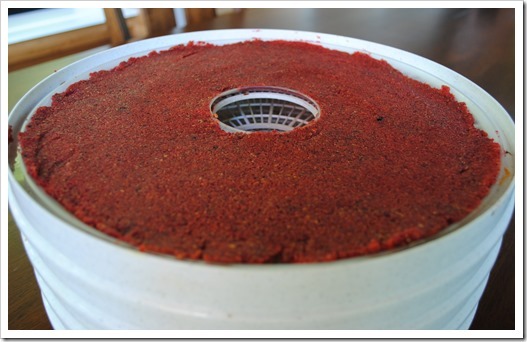 Dehydrate for 2-3 hours, and then, flip the mixture onto a second fruit roll sheet so the other side can dry. If you can’t seem to flip them from the sheet, use a spatula to manually flip sections. Here is what it looks like when you spread it onto the jelly roll sheet. Go for a consistent thickness. Yours may vary in color, of course, depending on your pulp. Here is a sample cracker. I end up with random chunks because I don’t bother to score them. These may not be formal crackers that you would serve to guests, but they are tasty and sort of addictive. If you crave salt, you could add a dash of sea salt or Himalaya salt to your mixture before you dry it, and end up with a saltier snack that can take the place of your chip craving! Oh, thank you so much for your pulp cracker recipe! Sounds great, and I love to avoid waste. Glad to help, Nance, let me know what combination you come up with! Just juiced carrots, so I think I’ll add some finely grated ginger, powdered lemongrass, Szechwan seasoning and some salt. Yum! Nance, that sounds so yummy! Let me know how it comes out! Where do you buy your powdered lemongrass? I bought it at an Asian food store. Actually, I bought an extra by mistake. Want me to send it to you (for free, since I won a green food drink powder from you awhile back)? Oh my gosh, that is so sweet of you! I am actually going to be by Uwajimaya, our big Asian foods store, today, so this gives me a reason to go in. Thanks for the offer, though, I so appreciate it! I had never heard of lemongrass powder so I’m excited to try it out. I sense a future review coming for powdered lemongrass! I don’t have a dehydrator or a juicer, but this looks so yummy. What a cool idea. Crackers are on my list of things to do. I bet it would work in a low oven too. Debbie, I have an idea for you. I thought this could work with a food processor, so I Bing’d it (ha, we don’t use the Google in our house since our bread is buttered, well, you know where). 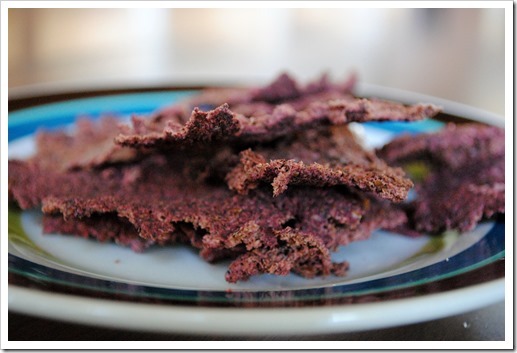 http://bonzaiaphrodite.com/2011/10/recipe-raw-pulp-crackers/ Check it out – she uses a food processor and gives some loose oven directions. And, those crackers use nut milk pulp and look amazing! Wow, that looks great, Angela, thanks for binging that for me! ha! I should start to make some “juices” and “milks” – especially when I can use the fiber for something like this. You didn’t miss it – I didn’t really say! One juice gives me about 2 cups of pulp and 16-20 ounces of juice, depending on what I put it it. It adds up quickly, which is why I wanted to find something useful for it. Now I am craving these crackers…off to make juice. Ha! Hahaha. You are going to laugh. Since we are talking about discards on this post and also on the Friday post regarding sourdough, it dawned on me. What about sourdough crackers!? And I found this post along with a multitude of others stating that sourdough crackers are outstanding. For those of us who don’t have a dehydrator can these crackers be done in the oven? Hi Rob, absolutely, using the lowest temp available in your oven. I don’t know times, though I’m sure a quick Google search could provide a bit of direction. Good luck!